Rennie Harris, hip hop dancer, artist, teacher, artistic director, choreographer, and founder of Rennie Harris Puremovement (RHPM), was born in Philadelphia, Pennsylvania in 1963. At the age of 15, Harris began teaching workshops and classes at universities around the country, educating the public of the relevance of street dances from any cultural origins. 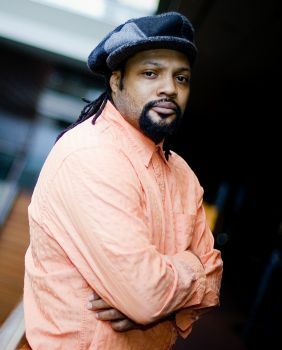 He is the recipient of the Kennedy Center Master of African American Choreography award, the 2007 Governor’s Artist of the Year Award (Pennsylvania), the 2007 United States Artist Fellowship Award, and has been highlighted in Rose Eichenbaum’s Masters of Movement: Portraits of America’s Great Choreographers (2007). A life-long Philadelphia resident, Harris formed RHPM in 1992 to counteract the commercialized stereotypes the mass-media industry presents of hip hop dance and culture. RHPM was founded on the conviction that hip hop dance provides a medium of expression for new generations to move beyond the boundaries of racial, religious, and economic differences through the power of original movement expression. Through his choreographic works for RHPM, Harris uses the ever-evolving style of hip hop street dance to reflect the distinct dance and movement impulses of current generations, while simultaneously representing the distinctive African American traditions of the past. Harris has educated audiences on authentic hip hop dance through outreach activities such as teaching, lecturing, and performing hip hop choreography for diverse audiences on the concert stage. In 2007, RHPM celebrated its 15th anniversary, performing a retrospective of Harris’s work, including one of his most celebrated evening-length sagas, Rome & Jewels (2000) based on Romeo & Juliet and West Side Story. Harris’s Rome & Jewels character developments are set apart from previous versions by using Jewels (Juliet) as an invisible character, which drives the actions of the male dancers without ever appearing onstage. Differing from traditional portrayals, Rome & Jewels fuses together dancing and dialogue as equal counterparts integral to the storyline’s completion. Rennie Harris continues to teach, choreograph, and serve as a hip hop ambassador to the world. He has served twice as the Director of the Hip Hop Program at The School at Jacob’s Pillow Dance Festival in Becket, Massachusetts, teaches master dance classes around the country, and is currently a Visiting Assistant Professor at University of California, Los Angeles in the World Art and Cultures Department.